Hi Guy's sorry to join this tread late but I spead most of my time in Model Shipwrights. I'm a die hard 1/144 nut! Love the scale as it allows civil airliners and military hardware to share the same space all in the same scale. I also make a few aircraft when I go to shows with my local IPMS branch last show saw 2 x Bf-109F-4 (sweet), 2 x Hurricane Mk.1 fabric wings (sweet) 1 x Fw-190A-5 (Eduard) and 1 x F-101A Voodoo (Otaki) get assembled ready for paint, except the Voodoo which requires 2 ton of filler. Obviously, we are both branching out from the Model Shipwrights site. Nice 1/144th subjects. A question for you, whose P-51 is that ? And how was the build ? I've been reading the Platz P-51 is best for a D Model, but I can't find any locally. Has anyone built these, and how was the build ? I have read that sweet have released some other kits, P-51B and P-47 but I have not seen them for sale anywhere, also Platz have a few others listed as 'discontinued' but I have not even had a sniff of those in the shops or on the web. We need the hobby shops to stock 1/144 I think that is the biggest problem, at least here in the UK it seems to be. Couple of other things yes to any 1/144 campaign you can count me in, and a couple more pictures. I adore Sweet even though I am a Dragon fan in every aspect. I couldn't have the oportunity to build the newer ones but the old kits were poor in detail but down right correct in the shape overall. So I really adore them. Revell is pretty good now compareing to the quality back in the 90's. These are my thoughts of course. I still dream of Dragon releaseing an F-4 Navy series. I sometimes can see a Dragon 1/144 F-4B VF-84 Jolly Rogers boxart when I close my eyes. Removed by original poster on 09/18/07 - 10:58:10 (GMT). Here's what is on my workbench at the moment. The latest addition is the Minicraft Ki-61 Hein. Not very high quality, but with a lot of filling... Much work remaining on all models. More pictures can be found at the "Rumble in the Far East" campaign thread. Ps. There are some truly amazing 1/144 aircraft currently displayed at http://www.clubhyper.com/forums/plasticpixframe.htm. Check it out! Some Great builds going on here, Thank you for the photo posts and keep them coming. There are plenty more great kits out there we haven't seen yet. Anyone ever notice how few of the helicopters get built and displayed ? I'm just as guilty, maybe I need to look over my build pile as well. So what are everyone's thoughts on that thread....helicopters ? So It´s chopper time now! 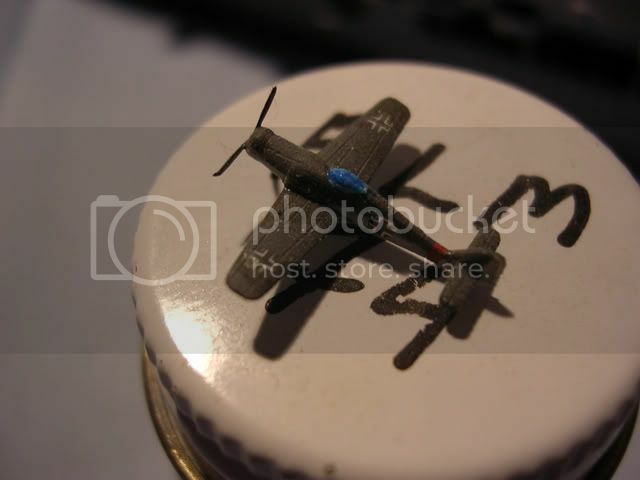 OK, I´ll show my little Siskorsky SH-3H Seaking from SWEET. I choose the most known Seaking, no 66 as this Is the Apollo recovery helicopter. Here you can see the Apollo recovery markings. Note the little Astronaut recovery mark on the door! This Is from when Gus Grissom´s capsule fired the door and went down! Grissom managed to escape and was rescued by the chopper. This kit Is not as refined as the new kits from SWEET. This Is a snap-together kit from the beginning, updated with some new and better details. Despite It´s origin, It´s a very nice and easy build. I have several more to build! My 1/144 pilots have arrived from Ozmods! 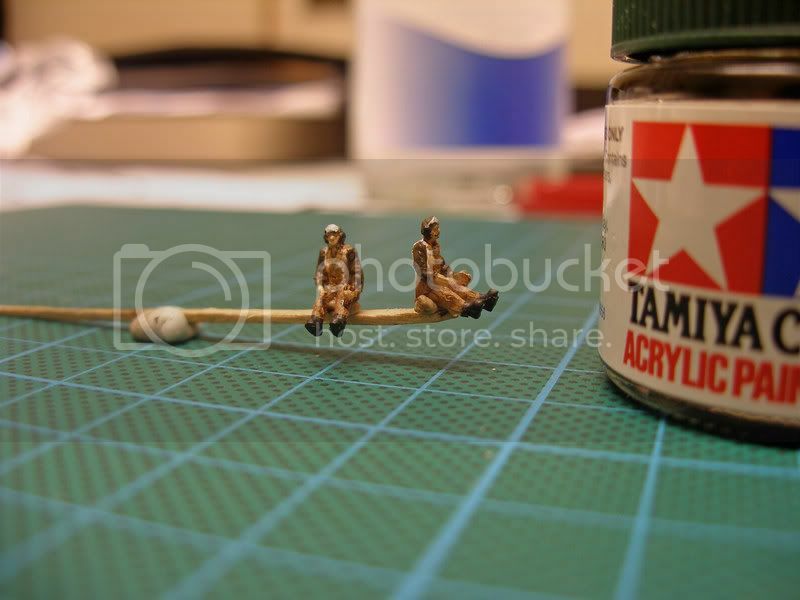 The sitting pilots come in two generic sets (WWII or Modern). The standing ones come in different eras and nationalities. 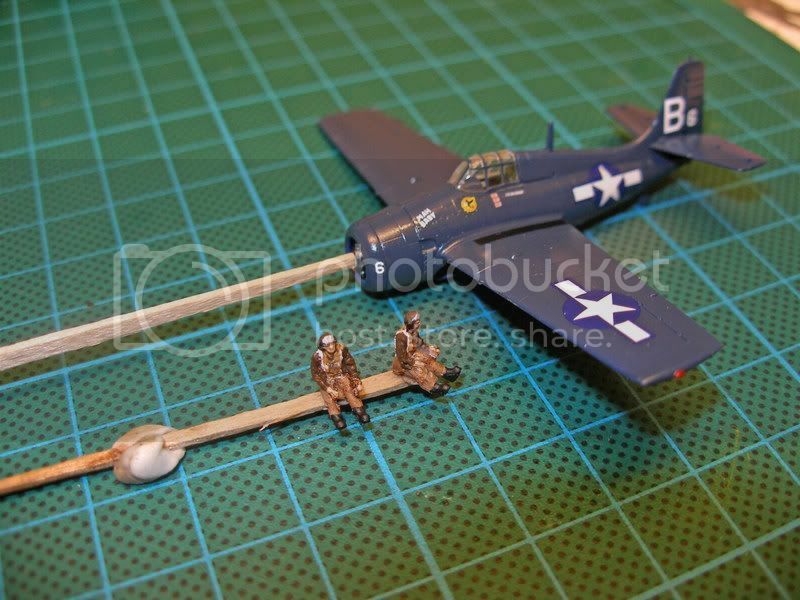 I painted these USAAF pilots rather swiftly (after all, they are going to be behind 1/144 canopies!! ), but I kinda like the results. A few touch-ups and they'll be finished. I will give you an update when I've painted a few more of these fellas. "Hey, isn't it my turn to fly today!? You've been hogging this FM-2 all week..."
By the way this is my newest bird. 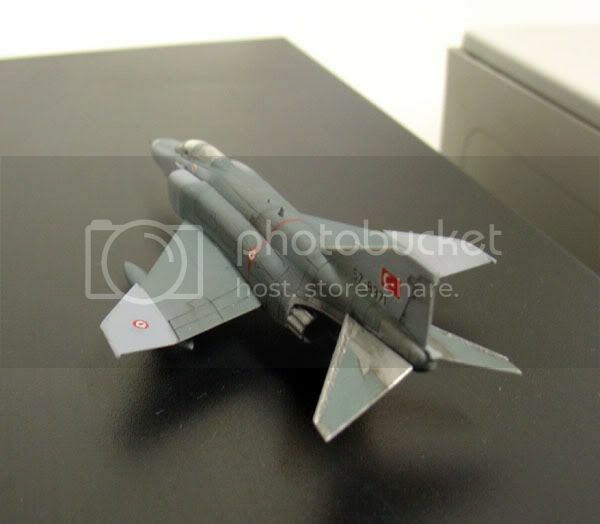 F-4E in Turkish Air Force service. I finished her in a hurry so there is to be some more detailing to be done. She won a 3rd prize in small scale Turkish class. Nice builds, guys, keep them coming. Yalym, which kit is your F-4 ? 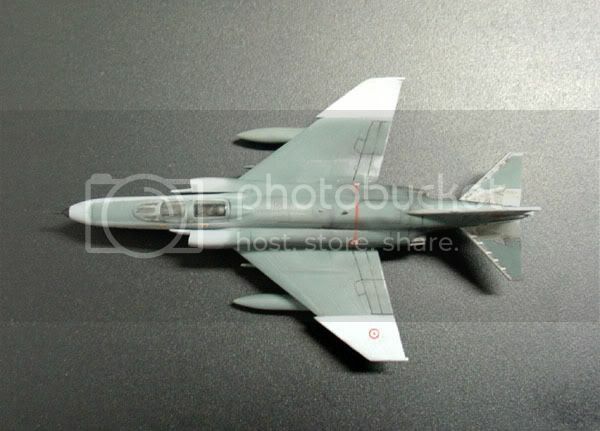 This is one aircraft we need an updated 1/144th model of. It would be nice to see this one put out at today's standards. Not to speak of the F-4 family that could be built up. Plenty of choices there. Thanks Frig! This is Platz's Kai kit. Even though having some toyish detailing it is the best I see so far. It is originaly from a company called F-Toys which is doing prepainted collectibles. It has a very nice detail scheme but as I mentioned before they are a little exagerated. Fixes up wwhen painted though. Has nice decals and comes, as other Platz kits, in two kits per box. 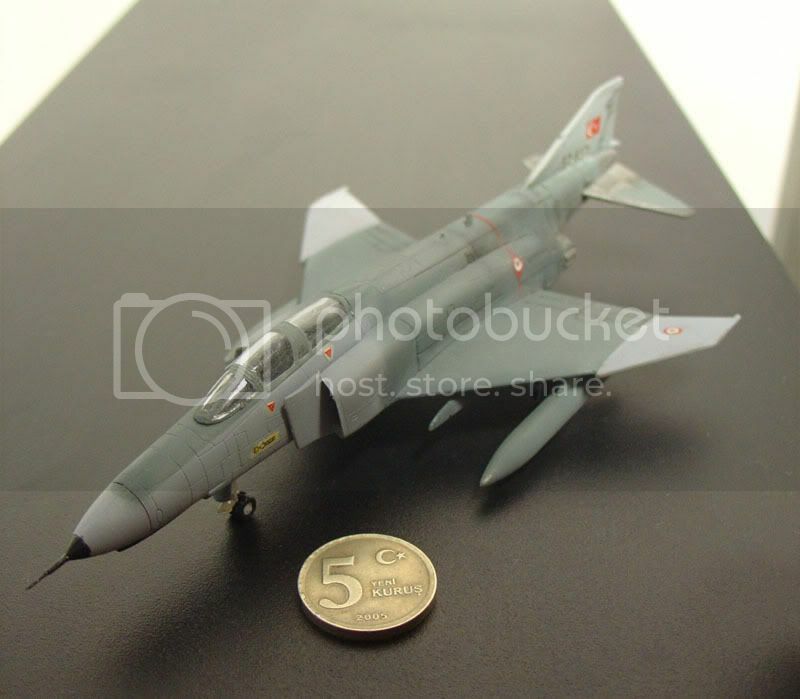 I strongly recomend to F-4 fans. On the subject of other companies I am afraid I don't agree with you about the "plenty of choises" part. Actually most of them are the same old LS kit. Arii is the best choice in clean mold issue. I haven't build the Revell one since I was a kid, so it is not right to put an emphasis on the subject, and didn't see the Minicraft one but it is probably also old LS kit. As I mentioned before I am still dreaming of Dragon releasing a VF-84 F-4B/N in the true scale. I would love to build in 1/144 because I like to build air tankers and in even in 1/72 some of these are pretty big kits. Problem is while I can find DC4, 6 and 7 kits, I can't find the S2 Tracker, P2V Neptune, P3 Orion, PB4Y2, CL215 or CL415. Sure the Canadairs are kind of odd so its not surprising they are not out there but where are the sub hunters? While not necessarily easy to find, there are a few of the kits you mentioned available. The P-2 Neptune had several different versions made by Aeroclub of England. The P-3 had a very nice kit produced in various markings by L & S, and I think is rereleasing these again shortly. The PB4Y-2 was marketed as a resin kit in 1/144th by Cobra Company of the US, who also produce a conversion kit of the PB4Y-1 for use with the Minicraft B-24. 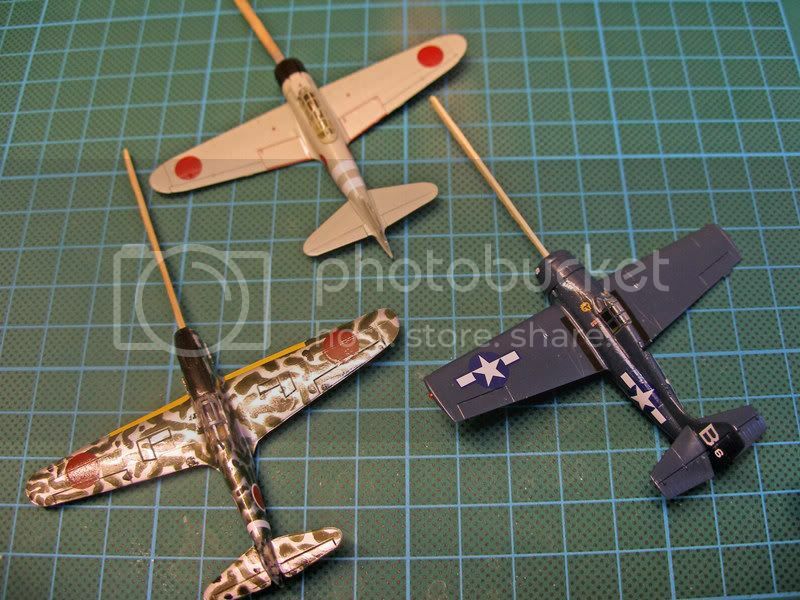 Heres my latest builds that I'm working on, thats two x Sweet Bf-109F-4trop and an Eduard Fw-190A-5. Outstanding....now there is an assembly line !!! But also, what is the little truck I see in the background ? Since I'm always looking for small items to put in a scene or vignette, that always interests me. Thanks for the link, Yal`ym. I notce that Platz is releasing a P-47 in December! Great news!!! Hi Bruce, it's a LWB soft-top Landrover in white metal, I can not remember the make as this has been sitting around on the bench for a long time. I know I got it at the IPMS-UK nationals last year so come November when I go this year I will make a point of getting some info for you. Well, we're closing in on Telford rapidly. Next month is the Big Show ! I hope some of our little group will be attending to let us in on what shows up in 1/144th ? I have no doubt we would all appreciate any info and photos, plus any intel on new stuff. All the 144 scale stuff I've seen has been pretty cool. Unfortunately it's all been prepainted. Also no cockpit detail whatsoever that I can see. Of course I've not seen too much. I have been seeing this everywhere, and I understand it's significance but I just have to know What the heck!H does Semper Fi actually mean? It's driving me bonkers! Build for yourself and for fun, not for others. Otherwise it loses it's magic. Hi Michael. Semper Fi is the short of Semper Fidelis as far as I remember. It is a Latin phrase that, more or less, means "Always Loyal". It is the Motto of the USMC as far as I remember. They like giving similar Latin mottos to their ships either. Sorry 'bout that. Yalym is quite correct, Semper Fidelis stands for "Always Faithful", the Corps' motto. (Among many others, which we won't print here !) I wasn't trying to confuse folks and shall think prior to sending messages in the future. A habit I need to watch. My present project for Modelshipwrights is winding down, so I started looking around. Question for all, has anyone built the PLatz F-8 Crusader yet ? How was the build, any problems. From what I can see, it looks like an F-8C. Since these were then remanufactured to the F-8K (if I remember correctly ! ) This should give us several options. Guys small update of my assemble line, not quite finished but almost there. Some small details and wheathering still to be done.